Home / Prep Baseball / Dons finally figure out East squad; other games, ppd. Dons finally figure out East squad; other games, ppd. Team members and coaches from Mountain Empire High and Gulliver Prep on Thursday following postponement of their scheduled game in Pine Valley..
LAKESIDE (3-22-2019) – El Capitan High needed to find an opponent after they were given the first-week bye to the revamped, 7-team Grossmont Valley League. 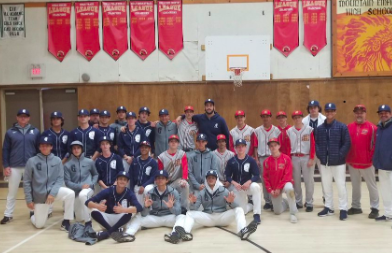 Unfortunately, all they could find was traditional power Cathedral Catholic, a ballclub already with a chip on its shoulder following previous trips — mostly losses — to East County schools. So the Dons took out their frustrations on the Vaqueros, pounding out four doubles among 12 hits to score in every inning to secure an easy 10-1 decision at Hostetler Field. Senior infielder Marcello Marino collected two of the doubles and walked, scoring all three times, as Cathedral Catholic (5-7) scored one run in every innings except the 5th, when they scored four times. The lone run for El Capitan (2-9) came in the 3rd, when third baseman Kevin Allison stroked a lead double to left field, coming around on a one-out single to center by shortstop Larry Snow. Both are seniors. The hits were the only ones allowed by Dons starting pitcher Tyler Reiter, who went the first four innings to gain the victory. Nico Ryder allowed just one hit — by El Cap catcher Austin Bell — over the final three frames to collect the save. Several games got underway with the hopes the skies would clear but there would be no such luck. The Christian-Mission Bay contest got off to wild start and other games played about an inning before the storms really hit. Out at Mountain Empire, the WarHawks were entertaining a team from Coral Gables, Fla., which is here for a weekend of games. After the teams couldn’t play, they went to the gym and had a tri-tip dinner while making new friends. The Gulliver Prep squad, which had taken an early lead over MEHS, hope to play Calvin Christian and Francis Parker over the next two days. During the offseason, officials of the Grossmont Union High Schools District elected to change the divide of baseball-playing schools to a 7/4 split rather than the traditional 5/6 or 6/5 split due to the CIF power ratings and keep a competitive balance. Thus, the Grossmont Valley League has seven schools — El Cajon Valley, El Capitan, Monte Vista, Mount Miguel, Steele Canyon, Valhalla and West Hills — each playing a home-and-home series for a total of 12 league games. Meanwhile, the Grossmont Hills League will play two rounds of home-and-home series among its four schools — Granite Hills, Grossmont, Helix and Santana — thus, each will play the other four times for its 12-game league schedule.